The first three miles of this hike are identical to the first three miles of the hike to Lemei Rock, as they both use the same trail. The trail leaves Forest Road #24 and gently climbs up a long ridge toward the lake. At about 1 mile you will come to the junction of Trail #102 which is actually another way to access the trail to Wapiki Lake and Lemei Rock. As you enter the Indian Heaven Wilderness, the trail gets steeper and you will encounter a few well placed switchbacks. Along this area you can catch glimpses of Mt Adams to the northeast. As you gain altitude, the trail wanders in and out of heavily forested areas. Then just before you reach the junction to the lake, the trail gets very steep and is in a dense forest. 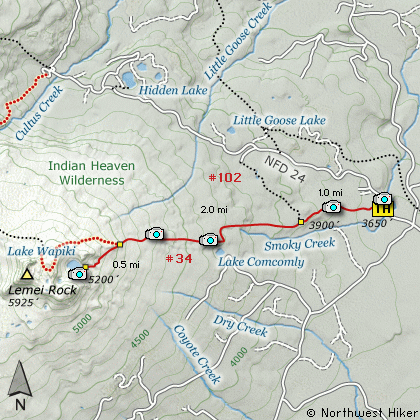 At about 3 miles you will come to the junction of Trail #34A, which you need to follow to Wapiki Lake. You will notice the sign reads Wapika Lake, so who knows how it is really suppose to be spelled? Anyway, this last half mile is quite steep, and it is mostly out in the open. The last little bit of the trail takes you through a grove of large trees, then there you are standing on the eastern shore of Wapiki Lake. 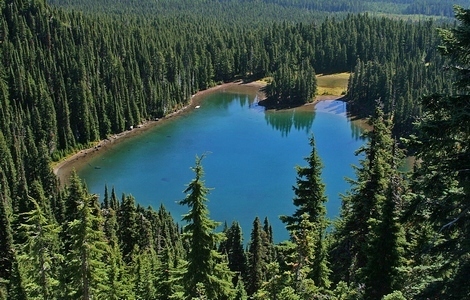 This is one of the most beautiful lakes in the Indian Heaven Wilderness, as well as the entire Gifford Pinchot National Forest. Your efforts to get here will be greatly rewarded. As you walk around the left, or south side of the lake, you will notice a small pond. Enjoy! From Portland, travel east on Interstate Hwy 84 to Exit 64 at Hood River. Turn left, and pass under the freeway and cross the toll bridge ($2.00) into Washington state. Turn left onto SR14 and drive approximately 1.5 miles to state road 141 Alt. Turn right onto SR141 Alt. and follow it another 2 miles and merge bearing left onto SR141. Then travel north on SR141 for another 19 miles to Trout Lake and the junction to Mt. Adams Road, which heads north to other hike destinations. Bear left and continue on SR141 westbound out of Trout Lake for about 5.5 miles and you will cross into the Gifford Pinchot National Forest and the road changes to Forest Road 24. Continue westward on FR24 for another 2.5 miles and you will come to the junction where FR24 turns north. Turn right and continue to follow FR24 north for another 5 miles and you will pass the trailhead for Wapiki Lake and Lemei Rock.